I tell this to other people all the time. And I mean it every time I say it, I really do. 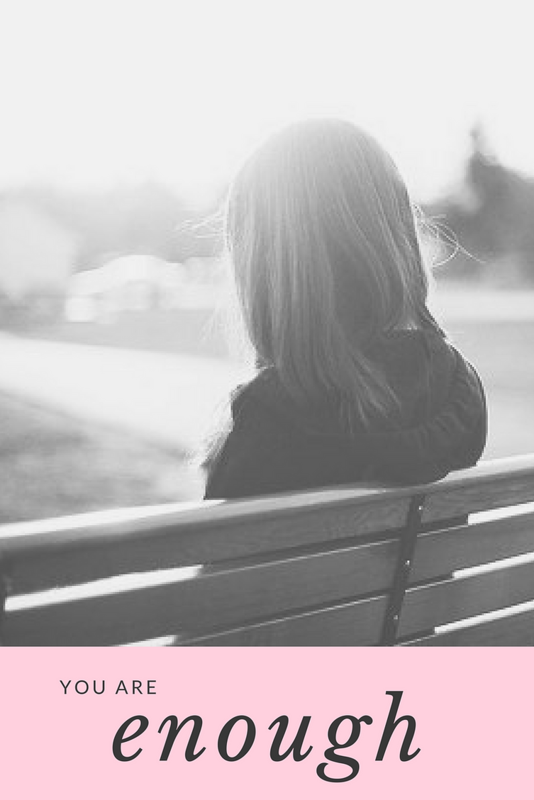 But why am I not enough? Ugh, this morning was rough. The kids woke up at the same time, which is sometimes just not awesome because it gets chaotic when they both need me at the same time. We were in a big hurry to leave so I could make it to my workout on time. Halfway to the gym I realized I forgot to brush Ava’s teeth. Carson’s bottle? I left it on the counter next to the kids’ breakfast that I also forgot to put in the car. I guess I’ll just give them my apple. “Mommy, I need to go potty!” Didn’t we just do that? Okay, quick potty break! I looked in the mirror before getting out of the car and I had only put mascara on one eye. Just one. We piled out of the car and ran inside because we were late again. 5 minutes into class Carson choked on an apple. How could I let that happen? I should have been watching him more closely. Class was over and I headed to the coffee shop with some of the other girls… JUST what I needed. Getting to have adult conversation was so nice, until Carson lost it because he was late on his nap. Why can’t he just sit like all of the other little quiet babies? Then Trey called to see where I was because I forgot to drop off his lunch when I was on post, even though I told him I would. #wifefail. “Mommy, I had a big accident!” The words you never want to hear from your toddler, especially in public. She couldn’t get the belt off in time to use the potty. How did I forget to help her with that? I left our 2 hour coffee date with tears in my eyes because life. Just, life. When I left coffee, one of my girlfriends asked why I seemed off. Oh, I was off, alright! I felt like I failed. Like I wasn’t enough. Like my kids and husband deserved better. This morning has been so great! The kids woke up at the same time, which was fun because the kids both tackled me with hugs for several minutes. We were in a bit of a hurry to leave so I forgot a few things, but that’s okay, I’ll just make a list next time. They can eat my apple today. “Mommy I need to go potty”, it’s a good thing I keep a little potty in the car! My mascara looks hilarious, so I’ll just laugh about it. We were a few minutes late but at least I’m here! Carson choked on an apple, but guess who giving him the Heimlich .0002 seconds later? His awesome mom who had the motherly instinct to pop that sucker out of his esophagus. I headed to the coffee shop after class and had a blast just hanging out with the girls! Carson was amazing for the first hour and a half, and naturally got a little fussy around his nap time. Trey called to see if he could pick up his lunch from me– I love making his lunches and leaving little love notes. Uh oh, Ava had an accident but guess who always brings backup clothes! #prepared. It is amazing, truly amazing, what reframing my thoughts did for me. I could have continued the pity party for the rest of the day. But I made the decision to take those thoughts captive. Sure, Mommin’ ain’t easy, I’m totally with you there! But we are killin’ it in the mom-department! 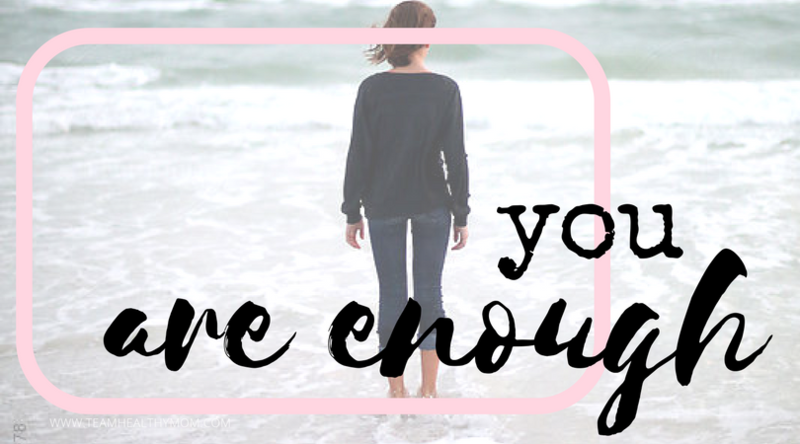 You ARE ENOUGH because you just ARE. I hope this encourages you to throw every single one of those negative thoughts out the window. Let’s focus on who we are rather than who we aren’t!